You are at a wedding, in a marquee that is on fire. Switch your character to Ron (Suit) and use the ‘Weasley Wizard Wheeze Box (WWWB)’ to break up the piñata which will drop some Lego bricks. Use the ‘Wingardium Leviosa (WL)’ spell on the bricks to create a transportation ring. Stand in the ring and press and hold the A button. (Wizards Hat) – Use the ‘Reducto’ spell on the balloon to release it (there are 5 of these scattered about the marquee, release them all the get a Wizards Hat). One of the balloons is only accessible in free play mode after going through the second transportation ring. (Wizards Hat) – (Free Play Mode) Switch to a ‘Dark Magic’ character and use ‘Dark Magic’ on the pile of red and black Lego bricks to build a violin and gain a Wizards Hat. Go back through the transportation ring. Use the ‘Reducto’ spell the flower to destroy the flower, leaving the plant pot. Use the ‘WL’ spell on the plant pot to put out the fire. Use the ‘Deluminator’ spell on the two lamps to move the light to the unlit lamps; this will melt the ice sculpture. A Hermione bag spot will be left behind when the ice has melted. (Free Play Mode) – Switch your character to Luna Lovegood and use the ‘Spectraspecs’ ability to reveal another transportation ring. Use the transportation ring to transport your character to a secret area. Shoot the death eater to make the area safe to explore. (Unlock 6 Characters) – (Free Play Mode) Shoot the presents to the right of the transportation ring and you’ll find an Unlock 6 Characters token. (Xenophilius Lovegood Character) – (Free Play Mode) Switch your character to Harry and use the ‘Parseltongue’ cabinet to get a key. Use the key on the chest to the right side of the room to gain Xenophilius Lovegood Character token. Go back through the transportation ring and continue. Switch your character to Hermione to use the bag spot to get a fire extinguisher and use the ‘WL’ spell on the extinguisher to put out the next bit of fire. Note: For the fifth balloon, head to the bottom-right of the screen and you’ll see a barrel with orange handles, next to it you’ll see the fifth balloon to release. (Madame Delacour Character) – (Free Play Mode) Switch to a ‘Strength’ character and press and hold the A button to break off the front of the barrel to gain the Madame Delacour Character token. Use the ‘WL’ spell on the items on the floor in front of the table to place them on the table. This will uncover a blue exit platform, use it to continue. You’ll now find yourself in a winter wonderland. (First Brother Character) – Shoot the door knocker to the left of the ‘Quibber Dispenser’ and a bat with a key will start flying around. Shoot the bat to get it to drop the key (if you miss and the bat returns to safety shoot the knocker again) and pick up the key. Head to the far right of the area and you’ll see a little hit with a gate on the front. Use the key on the hut to gain the First Brother Character token. Head to the doorway and collect a pair Spectraspecs from the Quibbler Dispenser. Go to the left of the area and use the ‘Reducto’ spell on the padlock on the gate. (Wizards Hat) – Make your way to the left of the water feature where you’ll see a pile of Lego bricks, use the ‘WL’ spell on the bricks to fix the water feature and you’ll get a Wizards Hat. (Wizards Hat) – (Free Play Mode) Switch your character to Dumbledore and use the ‘Deluminator’ ability on the lamp in the area with the water feature to gain the light. Head to the right of the other area and you’ll come across on unlit lamp about half way through the area. Use the ‘Deluminator’ ability on the unlit lamp to light it and melt the ice to reveal a Hermione Bag Spot. Switch your character to Hermione and use the bag spot to find a Wizards Hat. Use the ‘WL’ spell on the snow-covered grave to the right of the gate. There are five graves in total which all require different actions. (Second Brother Character) – On the right hand side of the first set of graves there is a pile of snow. Use the ‘Reducto’ spell on the snow to achieve the Second Brother Character token. To the right of the doorway you’ll see a heating outlet pipe, use the ‘Reducto’ spell the pipe and then use the ‘WL’ spell on the pieces of pipe to direct the steam to the grave to melt the snow. Head to the right the wall and use ‘WL’ spell on the pile of Lego bricks by the grave. Use the ‘WL’ spell again to melt the snow on the grave. (Hyper Cast Red Brick) – Around the area you’ll see three brown flower storks on the floor, use the ‘WL’ spell on the flowers to place them back on the graves and gain the Hyper Cast Red Brick. (Narcissa Malfoy Character) – Shoot the snowman to the right of the hut with a yellow lock to gain the Narcissa Malfoy Character token. Use the ‘WL’ spell on the candle to melt the snow on the grave. (Wizards Hat) – Before clearing the final grave, use the ‘Pet’ ability to kill the three rats to gain a Wizards Hat. 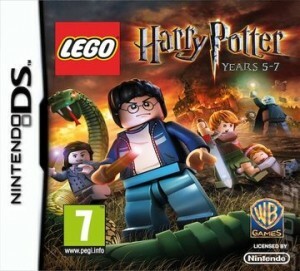 Using the ‘Pet’ ability dig up the Hermione Bag Spot, then use Hermione on the Bag Spot to get a hair dryer. Use the ‘WL’ spell on the grave to clear the snow and exit through the gate. Now you’ll find yourself in an old house. (Bathilda Bagshot Character) – At the top and the bottom-right of the room you’ll see two spiders come down on webs, use the ‘Reducto’ spell on both of them to gain the Bathilda Bagshot Character token. Go through the doorway at the back of the room. (Wizards Hat) – Use the ‘WL’ spell on the rotten food to put it all in the bin and then use the ‘WL’ spell on the bin lid to gain the Wizards Hat. (Mafalda Hopkirk Character) – To the bottom-left of the room, there is a pot of the table, use the ‘WL’ spell on the pot to gain the Mafalda Hopkirk Character token. Use the ‘Reducto’ spell on the padlock on the cabinet to get a Hermione Bag Spot, switch your character to Hermione and use the bag spot to get a watering can. Shoot the watering can and then use the ‘Arguamenti’ spell to fill up the watering can. Finally, use the ‘WL’ spell on the watering can to put out the fire from the oven. Use the ‘WL’ spell on the pile of Lego bricks to create a pair of teeth, use the ‘WL’ spell on the teeth and direct them towards the pile of books to reveal the staircase. Head up the stairs, you’ll be faced with a snake. Watch out for the poison he spits out, when the first item appears in front of the snake use the ‘WL’ spell on it and use the directional buttons to spin the item towards to snake, this will happen three times. When the snake does dizzy use the ‘WL’ spell on the item to make the snake swallow it and then use the ‘WL’ spell on the snake. Repeat these actions another two times to complete the chapter.